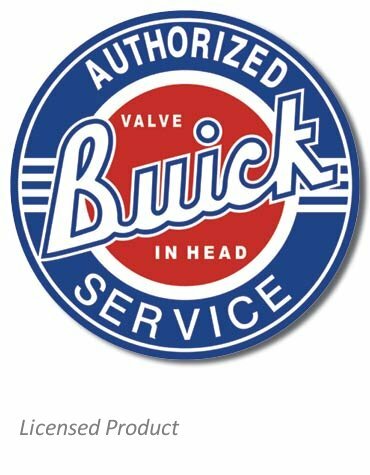 This is a licensed reproduction of an old Buick sign, advertising service for Valve-In-Head engines. Something likely to be posted on the wall at a Buick dealer or service station. A great decoration for the garage, office or den. It also makes a great gift for the Buick nostalgia collector or aficionado. This is a metal sign, made in the U.S.A. Measures 11.75 inches round. UPC: 6-05279-10185-6 | Part No. 185. Ask a question about "Authorized Buick Valve-In-Head Service" Tin Sign.